For a friend’s wedding this month, I wanted to make a cute gift basket that they could use right away as a couple. I really had no idea what “theme” I was going to use until I saw this beautiful cold brew coffee kit at Cost Plus World Market. That’s where I got the idea that I would make it a coffee themed, cozy gift basket. *This post contains affiliate links. To read my full disclose click here. I struggled with finding an affordable large basket that I knew they could continue using. I saw this one at Michael’s Craft Store and thought it would be perfect. It was a little difficult to work with as it’s kind of floppy and not as structured as I would have wanted. But I still think it turned out perfect. The texture of the basket and the handles on each side is why I really love it. I originally had planned to put a french press in the basket too, but when I saw this beautiful vintage style coffee grinder, I thought that would be a fun touch instead! (I love how it can be used as a decoration in the kitchen while also being functional). I picture the newlyweds baking these pumpkin scones together and then snuggling on the couch sipping coffee while the warm Fall scent of the candle fills the room. I didn’t add a bow or any ribbon- I love how it looks, just like this ! I just had to get cheesy with the wifey and hubby mugs! 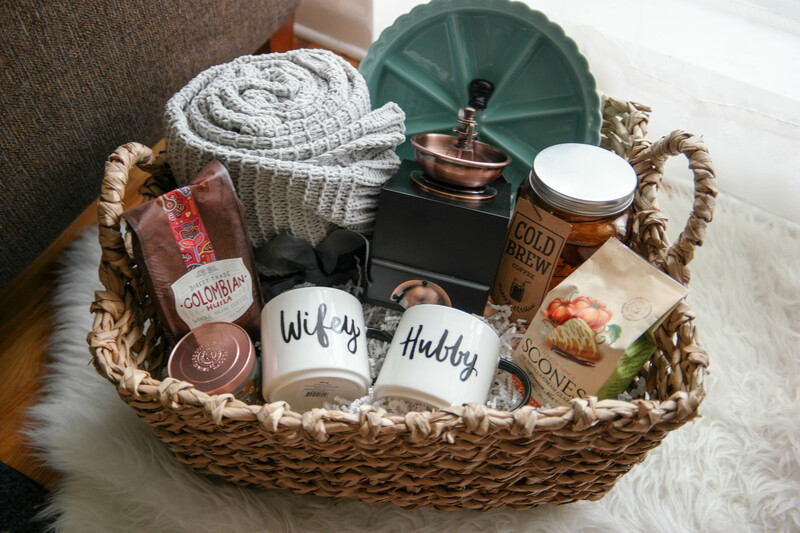 I had so much fun putting this gift basket together and hope you got some inspiration for your own gift basket ideas! Ok, this is such a cute idea! I have never even thought to make something like this, but I LOVE how personal this is! I would have loved getting something like this at my wedding. I love the idea of this gift basket. So romantic. Your choices of inclusions are lovely as well as the list of other options you added. Really thoughtful. I love this! This is a great idea and such a thoughtful gift. I’ll be doing these next time someone gets married. Such a sweet idea! My BiL&SiL received a basket with various bottles of wine with labels around the necks as a wedding present. A bottle for each “first” during the first year. Such a thoughtful gift! Awesome! These types of gifts are my favorite! I would like to start gifting this way, thank you for the neat idea. I love baskets and this year I think I’m going to do a bunch cause they are well easy to do and nice to do! I absolutely love making my own gift baskets!! This one is adorable. I saw this on Pinterest the other day and thought it was adorable. 🙂 (I was searching for Christmas gift ideas) I hope the Bride and Groom loved it. I love this idea so much! Definitely going to pin this. I love this idea so much❤️ Can’t wait to do this for a friend! Thanks girl! What a perfect gift idea! !